Halloween Magic Video Slot Review - Casino Answers! Halloween Magic is a 5-reel, 5-line video slot developed by Slotland, featuring scatter wins, a free spins feature and a progressive jackpot. 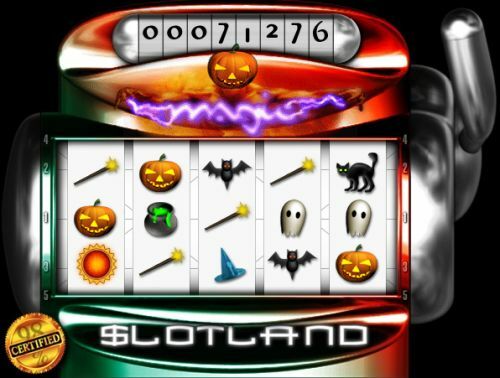 You can play the Halloween Magic video slot at Slotland Casino. Bets on the Halloween Magic slot machine are $0.50, $1 or $2. You can select from 1 to 5 paylines on the Halloween Magic slot game. You can bet on different amounts on each payline. The minimum bet that you can make on the Halloween Magic casino game is $0.50 per spin up to the maximum total bet of $10 per spin. Halloween Magic has a low betting range that is most ideal for casual slots players. To play the Halloween Magic video slot, select your bet with the radio buttons below the slot machine and pull the lever. Halloween Magic is linked to the Slotland progressive jackpot. At the time of this writing, the current progressive jackpot is at $71,276. To win this progressive jackpot, 5 Jack-O-Lantern symbols have to appear on a payline on which you are making the $2 maximum bet. When not making the maximum bet, you will win the 1000 coin top jackpot instead. You can play for the Halloween Magic Progressive Jackpot at Slotland Casino! Gray symbols appear on the reels after every spin on the Halloween Magic slot game. Once those gray symbols spell the word “MAGIC” on selected paylines, you will win a free bonus spin. Every bonus symbol will win 5 of a Kind of a symbol, meaning that you will receive a guaranteed 50X win or more. The free bonus spin will be based on the bet of your previous spin, so you might want to increase your bet when you are close to triggering this special feature. 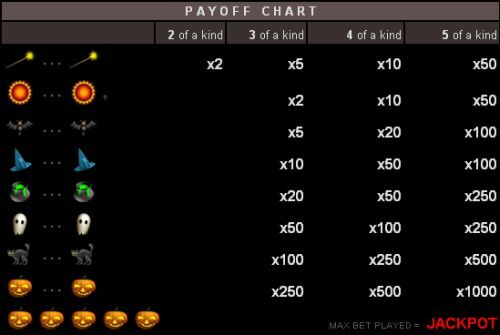 There are 9 paying symbols on the Halloween Magic video slot. The complete payout schedule is as follows (2/3/4/5 of a kind payouts in parenthesis): Magic Wand (2/5/10/50), Sun (-/2/10/50), Bat (-/5/20/100), Witch’s Hat (-/10/50/100), Cauldron (-/20/50/250), Ghost (-/50/100/250), Black Cat (-/100/250/500) and Jack-O-Lantern (250/500/1000 or jackpot). Halloween Magic looks a little antiquated, but it’s still a fun web-based casino game to play. It doesn’t have the animations that most Slotland games have, but rather is much simpler. You can play the Halloween Magic video slot when you sign up and make a deposit today at Slotland Casino. Are players from the United States allowed to play the Halloween Magic slot machine? Yes, players from the USA are most welcome to play the Halloween Magic slot game at the USA-friendly Slotland Casino. Can I play the Halloween Magic online slot for free? No, you must make a deposit to play the Halloween Magic video slot. Free or practice play is not available at this time at Slotland Casino. Do I need to download any casino software to play the Halloween Magic slot machine? No, there is no software to download to play the Halloween Magic slot machine. If you experience any difficulties with the flash casino, make sure you have the newest version of Adobe Flash Player installed on your computer. Where can I read other Halloween-themed slot reviews? If you are looking for more slots involving witches, vampires, zombies, monsters, werewolves or anything of the sort, you can read our list of Halloween slots.